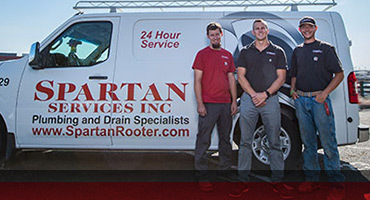 Spartan Services, Inc. is a family-owned, licensed plumbing and drain cleaning contractor with experienced and highly knowledgeable technicians who provide service with a personal touch. 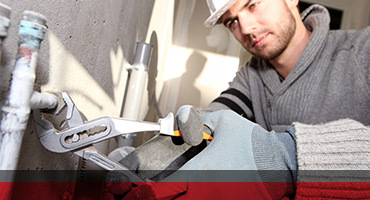 We specialize in emergency plumbing and offer 24/7 service. Serving the residences and businesses of Pierce, Thurston, and South King County, Spartan can handle all your plumbing needs, including hot water heater repair and replacement, and kitchen and bathroom remodels. We offer a five percent courtesy rate to seniors and military families. It is our goal to resolve your plumbing issue the right way the first time. Call Spartan today! Mason McCleary came to my house last Thursday to give me a bid on re-piping my house. Spartan was the third company to come out. I have galvanized pipes and two of my three showers had such low flow that we couldn’t use them. Mason was the only person who said before I re-piped, I should replace the ball valves in the shower handles as that might be the issue. On Friday, I bought two valves at about $15.00 each and replaced them. That completely solved my problem. I am very impressed with his honesty and integrity in telling me this as the first two companies didn’t mention it at all but also told me that when they re-piped, they would change all my valves as part of the project. I was going to go ahead and have my house re-piped after my third bid at a cost of about $10,000.00 or more. I am so grateful that I don’t have to. If I ever need any plumbing, you can bet I will call Spartan first. I will also tell my friends and neighbors what happened and recommend your company. We are under contract to purchase a home in South Tacoma but there are some areas of concerns following our home inspection. We were particularly concerned about the sump pump draining into the sewer. Failing to get a definitive answer from our realtor or the home inspector, I started calling plumbers. After speaking with Kandi, she immediately called back and confirmed for us that this is a “code violation”. I am very impressed with the friendly and prompt service even though we are not yet paying customers! Thanks so much and here’s hoping we can still make a deal on this house! Mark rescued us once again! 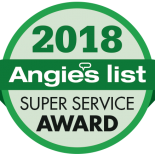 Sewage was starting to back up into the basement, and our line was clogged -our ancient 20’s era sewer clogged like clockwork every year – from roots and age. We’d call Spartan and ask for Mark. This time Mark gave us a discount for always asking for him, for multiple uses. It was only 250.00 this time!. *Normally, it’s a 350.00 job, or 325.00 for Angie’s members. Thanks, Mark! Mark was again, our hero. Sewer backed up, sludge in basement. We asked for Mark by name after the first time – with our 20’s home, sewer clogging was almost a yearly event. We’re getting the sewer replaced this summer, because our sewer is a shared sewer and the neighbors and us can split part of the expense. But for an emergency sewage back up Call Mark! I mean call Spartan, and then ask for Mark! For any plumbing needs, Spartan is a family owned business with long term employees, and communications are excellent. Highest recommendation.